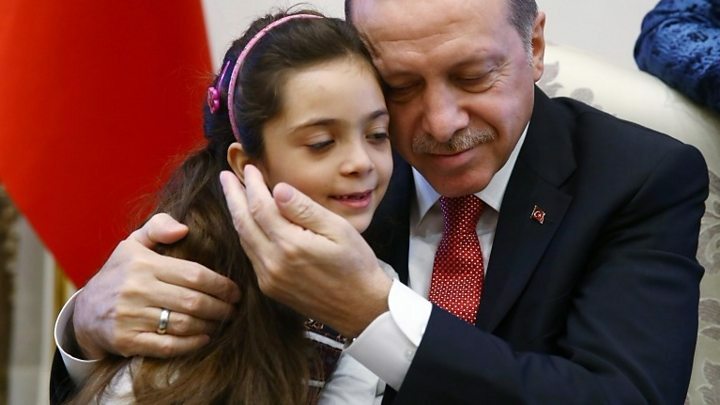 Media captionBana Alabed told Turkey's President Recep Tayyip Erdogan "I love you"
Bana Alabed - the seven-year-old Syrian who tweeted about life inside rebel-held east Aleppo - has met Turkey's President Recep Tayyip Erdogan. Bana and her little brother have been pictured sitting on Mr Erdogan's knee in the presidential complex in Ankara. President Erdogan sent a special representative to Syria to collect Bana and her family after they fled east Aleppo, the BBC has been told. Bana's plight came to light after she joined Twitter in September. The account captured everything from the death of her friends to her attempts to live a normal life. Along the way, she has picked up more than 325,000 followers, including JK Rowling, who sent her an electronic copy of Harry Potter to read. On Wednesday, Bana tweeted a picture of herself and Mr Erdogan, writing she was "very happy" to meet the president, while in a short video she is heard saying: "Thank-you for supporting the children of Aleppo, and helping us to get out from war." Bana's mother, Fatemah, who runs the Twitter account, decided to start it to show "how much kids are suffering from bombs and everything". In recent weeks, the appeals for help - from both Bana and her mother - have become more frequent, as forces loyal to Syrian President Bashar al-Assad began to close in around the rebel-held districts, which were being bombed from above by Syrian and Russian planes. After government forces surrounded the city, the family escaped under an evacuation programme. But they did not stay long in Syria. Within hours of Bana, her mother, father and two little brothers arriving in the rebel-held countryside to the west of Aleppo, they had been flown by helicopter to Turkey. Some had questioned whether the Twitter account was a publicity stunt and claimed Bana actually lived in Turkey already. However, an investigation by citizen journalism site Bellingcat deduced she was tweeting from inside rebel-held Aleppo. It is unclear whether the family are to stay in Turkey, where they would join almost 2.8 million Syrian refugees already living in the country.